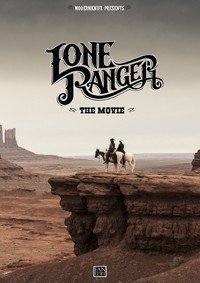 After growing up with the original Lone Ranger television show and seeing the 1981 film in the theaters and being disappointed, I had some curious expectations with Gore Verbinski and company taking on the material. The final result contained some beautiful cinematography with dozens of nods of Western films of the past, sharp direction of action scenes and a faithful retelling of the John Reid origin story...mixed together with almost schizophrenic tone in action, comedy, drama, slapstick and historical tragedy. The running time of 149 minutes stretched the plot and story beyond any necessary requirements. The challenge with this new edit was to produce a "100 minute" cut of the film out of the existing material. 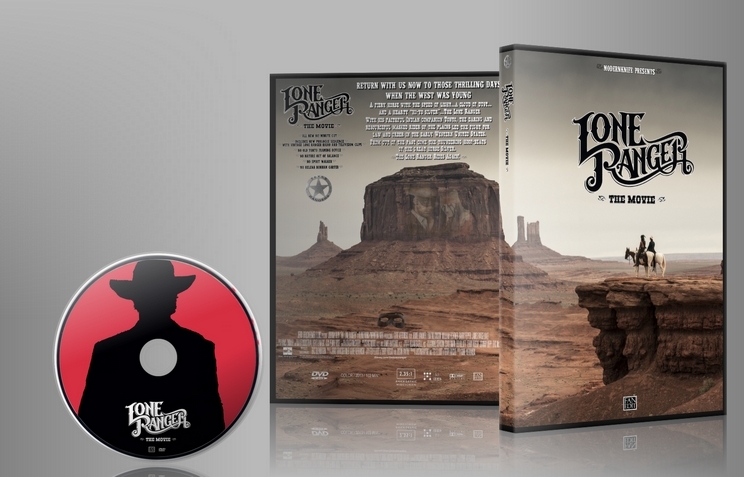 --Original clips from The Lone Ranger radio episodes. --Clips from The Lone Ranger TV show. --Clips from The Lone Ranger Animated TV Show. IS THAT HELENA BONHAM CARTER? --The entire Red Harrington subplot has been removed. --However, Red does appear in a few crowd shots that could not be removed. --The use of the Overture in the Bank Robbery scene has been removed. --Silver jumping from the top of the barn out of the flames has been removed. --Seeing Silver in action is held back for the final action scene with the first introduction of the William Tell Overture cue. --Removed all Old Tonto Scenes. --Added new 2m OPENING PROLOGUE w/ vintage Lone Ranger Radio & TV clips. --Removed John looking at Rebecca's picture on train. --Removed most of the slapstick banter between John and Tonto. --Removed Tonto throwing henchman through train window. --Removed shots of train wreck, including the flying metal spike. --Removed Tonto dragging John in the dirt, various bantering and bickering. --Removed backstory dialogue between John and Rebecca. --Removed scarf moment between John and Rebecca. --Removed Collins giving John flier for Red's. --Removed John refusing gun from his brother. --Removed some of Tonto's grave trading moments. --Removed Nature of Out Balance Bunnies at campfire scene. --Removed various lines of dialogue at campfire scene. --Removed entire visit to Red's place and hijinks with townsfolk. --Removed some lines between John and Tonto at Rebecca's home. --Removed some lines and scenes from inside burning barn. --Removed Super Silver moment jumping from barn in burning flames. --There are four sides to the bard, with only two sides covered by Butch's men. --Although not seen, it is implied that Lone Ranger and Tonto escaped from one of the open sides. --Removed some lines of uncertainty from John Reid before the shootout. --Removed and Rearranged scenes in the desert with Reid and Tonto. --Removed slapstick moments of John with Comanche tribe leader. --Removed stampede moment with Tonto and Reid in the ground. --Trimmed bickering between Reid and Tonto . --Removed Reid hitting Butch multiple times. Now after one hit, a direct cut to dragging Butch in desert. --Removed Reid knocking out Tonto. --Added scene of Lone Ranger and Tonto riding through town, robbing bank and finding nitro. re-scored with new sound effects and music from the Hans Zimmer soundtrack. --Moved up shot of bridge exploding. --Removed the soldiers distracted by Red and the girls. --Removed Red shooting the cart of explosives. --Since Red is cut, we do not see who shot the cart. --However, Lone Ranger is not yet seen in action, and he could have made this shot from on top of the buildings. --Removed a few hijinks in the train sequence (Tonto knocking out Rebecca, Tonto catching grape from kid). --Removed various dialogue from Lone Ranger. --Added quick flashback images in sync with the music as Cole remembers the "Bad trade". --Removed Lone Ranger on platform to accept the watch. --Removed Tonto's "Don't do that again" line at end. --Added sequence from beginning of Lone Ranger and Tonto looking out over valley. --Added freeze-frame of Lone Ranger and Silver in pose. --Added additional footage from Deleted Scene of Lone Ranger and Tonto riding toward next adventure. --Added Lone Ranger mask over clip from the closing moments of the radio show. As others have said before me, there's a few flaws in the narrative now. But it does get rid of a lot of the lame humor and make the characters i.e. Tonto a little bit more interesting and not so annoying. The only thing else I can add is I found the action scene's sometimes where cut to hard, where the action(s) didn't seem to complete or just abruptly change. I understand why some of these cuts where made, it's just in doing that the action(s) seemed a bit off. Overall I did enjoy this movie a lot more than the original. I especially loved the removal of the whole Tonto narrative, which I found very lame and just took me completely out of the film in the first place. So I gave this a miss in theatres as I read how bad it was but I was curious to see if a fan edit could make it tolerable. Well, it still didn't work for me but it's no fault of Modernknife. The quality of the video was very good but some of the edits were a little obvious - but I'm sure Modernknife did the best with what they had to work with. I thought the audio was very good as well. The narrative took some turns that were a little awkward and sudden. I had an issue with the production quality of the opening montage which I felt to be sub-par. I do really like the idea behind it and wish it had been more professional looking. It reminded me of the opening of Superman (1978) which I really like. One last quibble would be the exclusion of the majority of the end credits as I'm kind of a fan of credits if only for the play-out music. On the whole a good effort but I just didn't enjoy the film. Note that I bumped my Enjoyment rating from 4 to 7 as I did enjoy the quality of the edit, just not the film and I didn't want to bring the final rating down just because I didn't like the movie. I decided for a change, that I'd wait and watch this awesome sounding fanedit before I watched my copy of the original. It made for a very interesting experience. First off, my impressions of the material. It goes without saying that the decision to make the Lone Ranger the dumb sidekick of Tonto was insane so Modernknife has done his very best to reverse this. On one hand he's succesfully made him less of an idiot but he doesn't do all that much heroic either... until the end! Oh boy the train chase complete with theme tune is frickin' amazing! Tonto doesn't feel like an overpowering presence and was mostly a silent and mysterious support to The Ranger which I liked. Going by the cutlist I'd imagine the removal of the framing device was spot on as we jump almost straight into the action and the opening reel of Ranger history gets you right into the mood. I got goose bumps when the curtain rolled back, a very nice job! A few ugly CGI shots still remain that I'd like to have seen cut but mostly this looks great. The flashback was very well executed and I liked the 'on to the next adventure' ending. At 102 minutes the film/edit doesn't overstay it's welcome and is great way to spend a free evening. But on to the bad... plot is the biggest problem as I felt that at far too many points something hadn't been explained or that scene A cuts to scene C with scene B missing along with any explanation of how and why we got between A and C. I'll have to guess this is down to Modernknife's removals as from my experience Verbinski has never been one to shy away from lengthy and boring exposition so having no exposition at all seemed odd. A few examples... What was with the scarf thing, it seemed like a plot point? Did Tonto have magic powers or something because I missed how he got out of jail? Why did the LR turn up at the train on his own without Tonto, did they fall out? etc etc. The visual editting is solid but a lot of the sound edits are quite noticeable, although never to the point that they became annoying. Also it says in the cutlist that Helena Bonham Carter "Could not be removed" but she looked easily removable to my eyes? Overall, I think Modernknife has shown that "there be gold in these hills" (Or should it be silver) but I get the feeling that there is potential for another edit in this material. One with less of the overly heavy handed drama and more of the humour and fun. Yes... you won't be bowled over by the experience but you won't be bored either. As I said above, the train chase is worth the watch alone, so simply giving that thrilling sequence a new handsome streamlined frame was well worth the edit! I like others have stated before me, avoided the original film because I heard it was so bad, so when I saw there was a fanedit available, I decided to give it a try. This felt like a proper film and I didn't notice it was an edit except for one part at the beginning when the train crashed. I expected an explosion but there was nothing. The story was pretty basic yet it still lacked something because I really didn't care about the characters much. Also I hated the whole train/car chase, though theres nothing that can be done to fix that mess. A solid job from the editor, but I'd rather not see this film again. I purposely avoided The Lone Ranger when it was released because of all the negative reviews and the common theme among the reviews was "bloated". I am amazed how streamlined and tight you have made the narrative. There are no wasted scenes and the movie has real momentum. There are no hard cuts, no plot holes created. This feels like a real movie and not an "edit job" and everything flows together perfectly which is an amazing credit to your vision and skill. Unfortunately, the movie itself is still a bit lacking. Even though you removed a lot of the silly stuff, there are still huge tonal shifts from scene to scene. One scene will be gritty realism and the next scene will be rollicking adventure. However, that is not your fault. You can only work with what they gave you. Overall this is a fun western movie that I will add to my collection and watch from time to time. Thanks for your hard work!